There’s lots of attention on this season’s Chase for the Sprint Cup with it set to start at New Hampshire. What we haven’t heard a lot about lately is next season’s Chase and the “tweaks” NASCAR has said it was considering to alter the format. The worst thing NASCAR can do for the Chase right now is change it yet again (They could always eliminate it, but I don't hold out hope). The more changes, the more “tweaks,” the more expansion and retraction of the Chase field that is incorporated with new rules to create more drama, the more the Chase becomes just that: artificial drama. NASCAR Chairman Brian France has talked about trying to create “Game Seven” moments, like in a World Series. The point forgotten, however, is every World Series doesn’t go seven games. And the reason those series that do go seven games are remembered the most is because they don’t happen very often. Although NASCAR said it may not make any changes, it is becoming increasingly clear the Chase is headed into some sort of “elimination” format, where the original field of drivers is expanded but two to three times in the final 10 races a certain number of drivers are eliminated from contention. I hardly see the point of expanding the field only to kick those same people out a few races later. Since the Chase started in 2004, no driver seeded worse than third when it started has won it. That means for all the “drama” around the drivers who squeak into the Chase, little is heard from them after it starts. 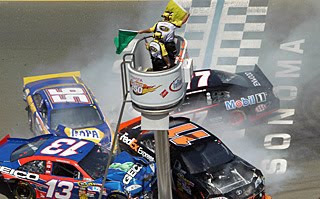 And any “winner takes all” format where two or more drivers are left battling for the title in the season’s final race at Homestead, Fla., does little to recognize the winner for a great season of competition. It will, however, certainly make that driver the champion of Homestead. Unfortunately, the Cup series only visits there once a season. So what exactly, have you won?